When it comes to Paleo and oils, coconut oil immediately springs to mind. Most Paleo followers are unaware that other similar tropical oils even exist. Palm oil is a relative new comer to the West, but it seems to be growing in popularity on a daily basis. It is interestingly one of the few fatty fruits to exist. Should we be considering palm oil in the Paleo lifestyle, and is it worthy of Paleo status? Palm oil is the umbrella term used for the oils which come from the fruit of the palm tree. Palm oil is extracted from the pulp of the fruit of the palm tree and palm kernel oil is extracted from the seed of the fruit of the palm tree. This is the virgin unrefined oil before it goes through any further, mass processing. It has a reddish colour and a strong taste which is not for everyone. Palm oil (next up) is simply a refined version of red palm oil. After the fruit of the palm tree is separated from the bunch they grow in they are then softened and pressed in order to release the oil. This processing is minimal and does not change the good characteristics of the oil. The problem is that palm oil has quite a strong and distinctive taste, small and color. For this reason many companies refine the oil further than the processed mentioned above and the oil is no longer virgin. This is not a problem as long as the oil has not been hydrogenated (?). As mentioned, the palm kernel oil comes from the actual seeds of the fruit instead of the flesh of the fruit. 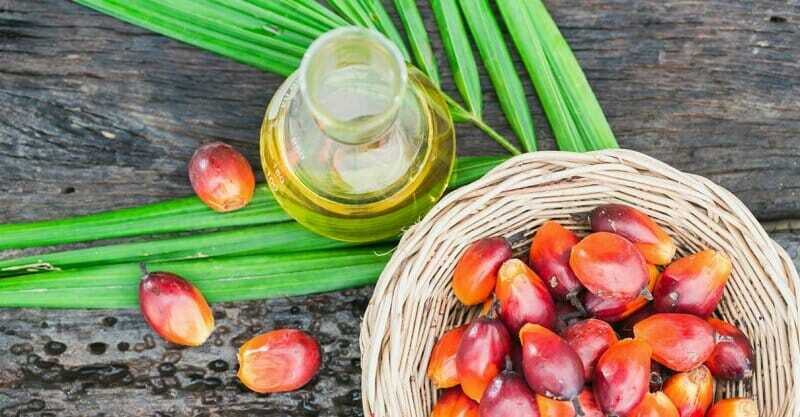 Palm kernel oil is a highly saturated oil with a composition similar to coconut oil.This indicates that this oil will be stable for cooking at high temperatures as well as being stable whilst being stored. Because of the virgin nature of red palm all it is still full of the natural vitamins and antioxidants (?,?). Made up of both tocotrienols and tocopherols, these help support the heart and protect it against stress. Red palm oil has up to 15 times more betacarotene than carrots and up to 300 times more lycopene than tomatoes. Coenzyme Q10 helps the body convert food into energy. It is also a powerful antioxidant. 50% saturated fat, 40% unsaturated fat and 10% polyunsaturated fat. Of the fats , 50% is made up of medium chain fatty acids (MCFA). The offshoot of this composition is that this oil can play an important role in improving cardiovascular health. Despite the high levels of saturated fat, this oil does not contribute towards atherosclerosis (?). Unfortunately there is a strong drawback to purchasing and using this oil which is not nutrition related. As much as your focus may be Paleo and living a healthier lifestyle it is neccessary to know what consequences your choices will make on the environment for one. The recent increased worldwide demand for this oil has meant that acre upon acre of rainforest has been destroyed to make room for plantations of palm. This has meant that many already endangered animals are affected simply because of our human need for oil. One such creature which is mostly affected is the orangutan. Luckily you can still buy sustainable palm oil and ensure that the choices you are making are not having a negative impact on the environment. The answer is a definitive yes. Not only is palm oil minimally processed but it contains incredible nutrients which all contribute towards improved health. If you are happy with using coconut oil however, there is no strong reason to run out and buy yet another oil. The strong taste is not enjoyed by everyone and the sustainable, higher quality red palm oil can be quite costly.